On January 16, 2019 the Cancer Wellness Center will celebrate 30 years of helping people live better while living with cancer. We sat down to discuss the early days of the Center with one of our founders, Patsy Winicour, who is still very active with the organization today. While the Center has changed through the years, one principle remains the same – all services are provided free of charge. Founders, Patsy Winicour, Judy Brannon, RN, and Mary DeJager, LCSW sought to fill the gap in cancer treatment by creating a place that addressed the emotional crises that cancer patients and their families face. 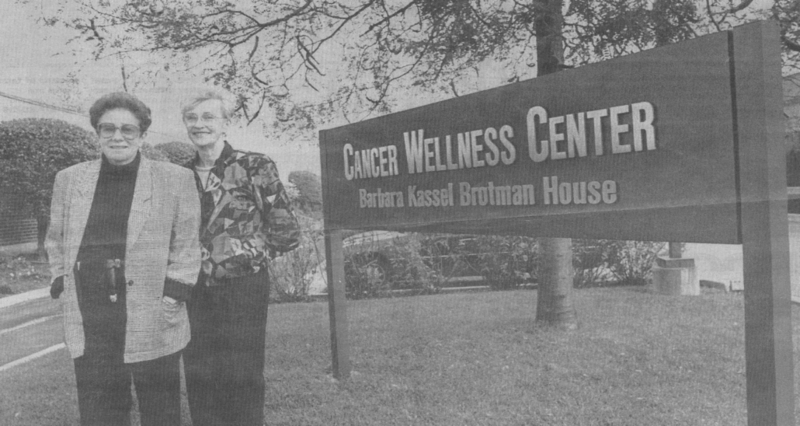 When the Cancer Wellness Center opened its doors in 1989, it utilized 900 sq. ft. of donated office space from Rush North Shore Hospital. They offered 3 support groups per week and a crisis hotline. The three founders shared the telephone line and took shifts answering calls, usually from newly diagnosed patients that wanted to talk to someone about what they were experiencing. One of the prime services the Center offered was matching participants to survivors. People learned about the Center through word of mouth and a series of articles in the local newspapers and demand for Center services grew steadily. In 1994, with the help of a generous gift from the family of Barbara Kassel Brotman, who had been an active participant in the Center’s activities, it was possible to buy a building and fulfill the dream of a permanent space to expand services to those facing cancer. At that time, the Center provided 24 groups or events per week and served between 200-250 people. As demand for programs increased, the staff grew to include a few contracted licensed therapists and an army of dedicated volunteers. The new 13,000 sq. ft building created comfortable surroundings for education workshops, tai chi classes, and an extensive library with a collection of resources where patients could learn more about their cancer, treatments, and the latest medical developments. In the last year alone over 1,500 new people walked through the doors of the Center seeking to transform the chaos and fear that comes with a cancer diagnosis into strength and hope. Today, we serve participants at the Northbrook facility and also at our Grayslake Campus and two area hospitals. We have 18 staff members that provide 20 support groups, 4 diagnosis-specific networking groups, and individual counseling sessions. In 2018 our staff, in partnership with cancer healthcare partners, were able to offer 63 educational programs and 100 wellness lectures/workshops. Stay tuned as we build the next 30 years of this special place. Congratulations to a great staff team, dedicated Board members and valuable donors for 30 years of incredible service. It is much appreciated by the community. Happy to continue and encourage supporting CWC. This very special place has been a beacon of light to so many people and their families at a difficult time in their lives. I am proud to have been a part of their journey for the past 30 years and grateful that the Cancer Wellness Center is there to support those in need when they need it the most.